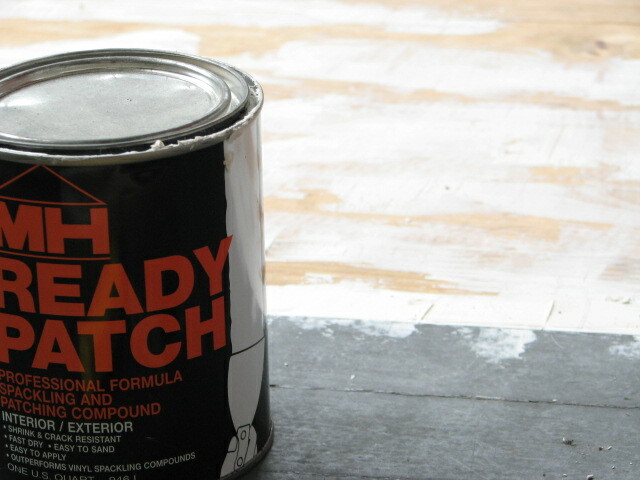 Tackling the Spackle and Lone Earrings | Small, but valuable. Week two of housewifedom is looking good. I would share all of the gory details of productivity (oh yeah, and that one morning of going back to bed from 9 to 11), but we don’t need to cover all of that. Especially not the sleeping in thing. You can forget about that. All of those little bursts of organization have reminded me of how much I love getting rid of things. I love getting rid of things even more than I love getting new things. It makes space for the things that you’ve loved for months/years/decades, which in turn makes it easier to find the things that you need to use. And that makes every day simpler. Who doesn’t want a simpler day filled with the things that you love (for free)?! I have run into a small snag in the clearing out process, however. It isn’t connected to clothes or pantry stuff or the kitchen. I’m ruthless with getting rid of clothes. Haven’t worn it in forever? It’s out. It turns out that the snag in my cutthroat reorganization is in the jewelry box. I have these earrings that are really still among my favorites (hence the problem), but half of the pair went missing a long time ago. There aren’t many options for half of an earring set other than looking like a proud 80’s fan. I’m not quite ready for that. They’re too pretty to throw away, right? Instaed of going 80’s, what I’m going to do is tell you a tiny bit about my favorite lone earrings, then toss them like a good girl. From left to right: 1) Nice, light-weight earring from my mom/Colorado. I like it. 2) From my favorite store (Anthropologie), used to be my go-to for trying to dress up a plain outfit. 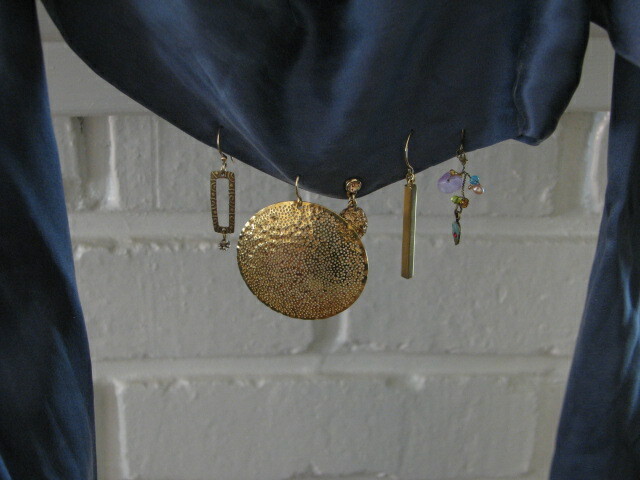 3) Prom earrings from 2002. Heck yeah. Good for fancier evenings out, other half definitely lost in Houston, TX, in case you happen upon it. Also, I still own and wear the same eye-shadow I bought for that prom. 4) Good, simple earrings… or earring, in this case. 5) A gift from my brother at Christmas sometime during college. I loved them. Used to wear them all the time until I lost one on a dog walk in my neighborhood. Peanut and I scoured that route about 6 times to try to find the other half. And there you go. You know way more than necessary about my taste in earrings and my tendency to lose things. And now a little something for the male readers (to make up for all of the earring talk). It’s spackle time. Or wood putty. Whatever you want to call it. I think that in this case, it’s technically spackle. Scott and I started to tackle that project yesterday. It’s a good project, actually. It’s kind of quiet, and it’s great to be on the porch, even if being on the porch involves work. Yeah, all of that spackle is totally unnecessary. Scott did a fantastic job of fixing the porch, and I just got carried away with my part of the job. Oops. 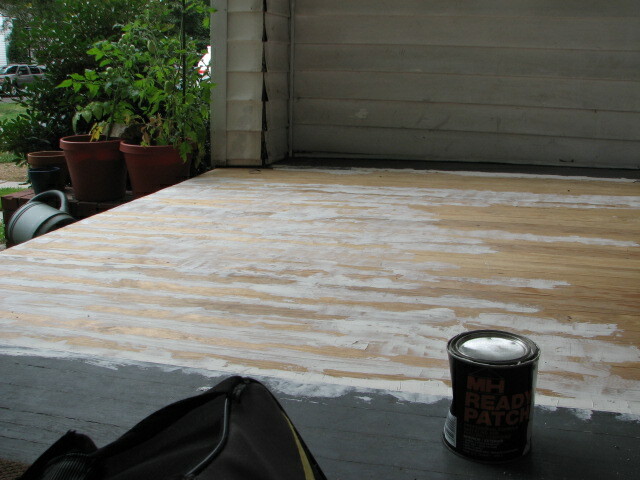 Here’s hoping that I get carried away with sanding and painting in a similar way so that the porch will end up smooth and taupe in the very near future.